If anyone of you loves Chinese Lo Mein and wants to make your own Lo Mein dish once day, then this post can help you. This post will tell you how to make stir-fried noodles with meats and vegetables; it’s very much similar to Chinese Lo Mein except you must use Lo Mein style noodles instead. Lo Mein noodles are thicker and softer than this type of noodles. Okee, let’s go making some noodles with meats and vegetables. In order to have a stir-fried noodle dish, you need to buy some ingredients then prepare them. When all are ready, let’s go to stir fry them all in separated sections. I mean you need stir fry vegetables first and then stir fry noodles. Then, finally, combine them all together and stir fry them one more time. Seasoning: sugar, salt, garlic, fish sauce, pepper, scallions. Can replace fish sauce with salt. Heat a saucepan, add some oil and some chopped garlic. Add sliced bacon and stir well. When bacon close to done, add pork organs (liver, heart,…) and continue stir well. When these two ingredients are close to be done (cooked), add mushroom and onion, stir well. Now, add seasoning likes fish sauce, salt, sugar. Stir well. When everything is mixed, dissolved, and cooked, remove from the heat, transfer to a bowl and set aside. Add oil to a hot saucepan. When the oil is heated, add noodles. Stir well and occasionally at the high heat and low heat later. When the noodles are cooked, add meats and vegetables in the high heat. Stir well until the vegetables are cooked. Remember to make sure they suit your tastes. Now, the noodles are ready for eating. Just add some to your plates and eat. Eat these noodles with mixed light fish sauce. Eating by rolling them in green leaves likes sweet choy or baby mustard green leaves. Avoiding dipping or add mixed light fish sauce when eating, we can add more sugar, salt or fish sauce when seasoning pork and mushrooms. Remember, don’t add too much. Actually, add the seasoning suiting your tastes. 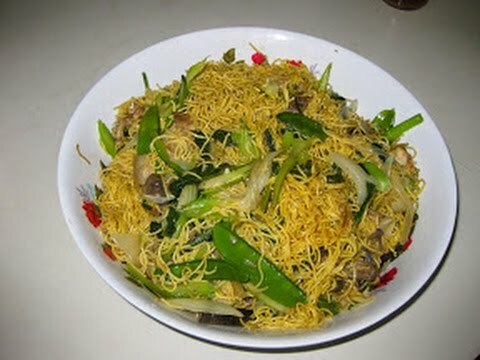 Here is another video shows you how to make stir fry noodles. You can use this technique to make your own dish of noodle stir fry/Chinese Lo Mein. This post was written and published on Jun 14, 2015 @ 06:02.